The review presented the importance of carvedilol using in terms of renoprotection in renal dysfunction at the pre-dialysis stage of the disease in order to reduce the risk of progression of chronic kidney diseases (CKD) and the development of cardiovascular complications. Immune and non-immune mechanisms (proteinuria, dyslipidemia, anemia, arterial hypertension) of renal dysfunction progression in patients with CKD of inflammatory and non-inflammatory origin are described. Moreover, with the slowing down of the glomerular filtration rate in CKD, the role of non-immunefactors in the development of cardiovascular complications becomes very important. In contrast to non-selective and some β1-selective beta-blockers, the use of beta-adenoblocker with vasodilating activity, in particular carvedilol, makes it possible to prevent the onset of the terminal stage ofCKD. Carvedilol, being a lipophilic beta-adrenoblocker of the third generation with alpha-blocking properties, influences the possible mechanismsof renoprotection: antihypertensive (including in combined antihypertensive therapy), anti-inflammatory, antiproliferative, anti-apoptotic, antioxidant, antiplatelet and others. Carvedilol due to the vasodilating effect softens the stress of the parietal shear, exerting a retarding action on theprogression of CKD. Carvedilol with a pronounced vasodilating effect and a long half-life significantly reduces central arterial pressure that is also animportant renoprotective mechanism in the treatment of patients with renal dysfunction. Carvedilol has an important renoprotective mechanism in CKD – inhibition of the secretion of the potent vasoconstrictor endothelin. In the metabolic syndrome, in which there is a significant risk of developing renal dysfunction, carvedilol levels the imbalance of adipokine secretion, insulin resistance, sodium and water retention, and the activation of renin-angiotensin-aldosterone and sympathoadrenal systems. Carvedilol at the early stages of CKD development shows predominantly antihypertensive action due to inhibition of the renin-angiotensin-aldosterone system activity directly in the kidneys. At the late stage of the disease, the drug is able to retain residual kidney function. That is, carvedilol can be used at all stages of CKD development, regardless of the etiology of kidney damage. 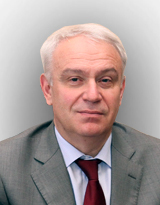 Ibragim S. Sabirov - MD, PhD, Professor, Head of Chair of Therapy №2 on the Specialty "General Medicine"
1. Mukhin N.A. Nefrologiya. National leadership. Quick Edition. Moscow: GEOTAR-Media; 2016. (In Russ.) [Мухин Н.А. Нефрология. Национальное руководство. Краткое издание. М.: ГЭОТАР-Медиа; 2016]. 2. Mukhin N.A., Glybochko P.V., Svistunov A.A. et al. Acute glomerulonephritis in the XXI century. Ter Arkhiv.2015;6:4-9. (In Russ.) [Мухин Н.А., Глыбочко П.В., Свистунов А.А. и др. Острый гломерулонефрит в XXI веке. Терапевтический Архив. 2015;6:4-9]. 3. Mukhin N.A., Kozlovskaya L.V., Bobkova I.N. et al. Inducible proteinuria mechanisms and the possibility of remodeling tubulointerstitium nefroprotektsii in glomerulonephritis. Vestnik Rossiyskoy Akademii Meditsinskikh Nauk. 2005;1:3-8. (In Russ.) [Мухин Н.А., Козловская Л.В., Бобкова И.Н. и др. Индуцируемые протеинурией механизмы ремоделирования тубулоинтерстиция и возможности нефропротекции при гломерулонефрите. Вестник Российской Академии Медицинских Наук. 2005;1:3-8]. 4. Moiseev V.S., Mukhin N.A., Kobalava G.D., et al. Cardiovascular risk and chronic kidney disease:. Kardionefroprotektsii strategy. Klinicheskaya Nefrologiya. 2014;2:4-29. (In Russ.) [Моисеев В.С., Мухин Н.А., Кобалава Ж.Д. и др. Сердечно-сосудистый риск и хроническая болезнь почек: страте-гии кардионефропротекции. Клиническая Нефрология. 2014;2:4-29]. 5. Hou F.F., Zhang X., Zhang G.H., et al. Efficacy and safety of benazepril for advanced chronic renal insufficiency. N Engl J Med. 2006;354:131-40. 6. Lewis E.J., Hunsicker L.G., Clarke W.R., et al. Collaborative Study Group: Renoprotective effect of the angiotensin-receptor antagonist irbesartan in patients with nephropathy due to type 2 diabetes. N Engl J Med. 2001;345:851-60. 7. Flynn E.R., Marbury D.C., Sawyer R.T., et al. Amlodipine reduces inflammation despite promoting albuminuria in the streptozotocin-induced diabetic Rat. Nephron Extra. 2012;6(2):205-18. 8. Wieczorek-Surdacka E., Świerszcz J., Surdacki A. Effects of atorvastatin dose and concomitant use of angiotensin-converting enzyme inhibitors on renal function changes over time in patients with stable coronary artery disease: A prospective observational study. International Journal of Molecular Sciences. 2016;17(2):106. 9. Bakris G.L., Hart P., Ritz E. Beta blockers in the management of chronic kidney disease. Kidney International. 2006;70(11):1905-13. 10. Hahn L., Hahn M. Carvedilol-Induced Hyperkalemia in a Patient With Chronic Kidney Disease. Journal of Pharmacy Practice. 2015;28(1):107-11. 11. Hiremath S.B., Lokikere S.D. Carvedilol as nephroprotective agent: a meta-analysis of randomized controlled trials. International Journal of Basic & Clinical Pharmacology.2016;5:3:769-74. 12. Bakris G.L., Fonseca V., Katholi R.E., et al. Metabolic effects of carvedilol vs metoprolol in patients with type 2 diabetes mellitus and hypertension: a randomized controlled trial. Jama. 2004;10;292(18): 2227-36. 13. Brehm B.R, Bertsch D, Von Fallois J, Wolf S.C. Beta-blockers of the third-generation inhibit endothelin-1 liberation, mRNA production and proliferation of human coronary smooth muscle and endothelial cells. J. Cardiovasc. Pharmacol. 2000;36(5):S401. 14. Devereaux P.J., Scott Beattie W., Choi P.T.L., et al. How strong is the evidence for the use of perioperative b-blockers in non-cardiac surgery? Systematic review and meta-analysis of randomised controlled trials. BMJ. 2005;331-3. 15. Feuerstein R., Yue T.L. A potent antioxidant, SB209995, inhibits oxy gen-radical-mediated lipid per-oxidation and cytotoxicity. Pharmacology. 1994;48:385-91. 16. Dandona P., Ghanim H., Brooks D.P. Antioxidant activity of carvedilol in cardiovascular disease. Journal of Hypertension. 2007;25(4):731-41. 17. Yue T.L., Mckenna P.J., Lysko P.G., et al. SB 211475, a metabolite of carvedilol, a novel antihypertensive agent, is a potent antioxidant. Eur J Pharmacol. 1994;251:237-43. 18. Ohlsten E.H., Douglas S.A., Sung C.P, et al. Carvedilol, a cardiovascular drug, prevents vascular smooth muscule cell proliferation, migration and neointimal formation following vascular injury. Proc Natl Acad Sci USA. 1993;90: 6189-93. 19. Packer M., Bristow M.R., Cohn J.N. et al. The effect of carvedilol on morbidity and mortality in patients with chronic heart failure. New England Journal of Medicine. 1996; 334(21):1349-55. 20. Zakirovа A.N., Gabidullin P.P., Zakirov N.E. Clinical and hemodynamic effects of carvedilol, the effect on lipid peroxidation and inflammatory markers in patients with IHD with CHF. Serdechnaya Nedostatochnost'. 2006;7(1):14-6. (In Russ.) [Закирова А.Н., Габидуллин Р.Р., Закирова Н.Э. Клинико-гемодинамические эффекты карведилола, влияние на перекисное окисление липидов и маркеры воспаления у больных ИБС с ХСН. Сердечная Недостаточность. 2006;7(1):14-6]. 21. Kelly R.A., Smith T.W. Cytokines and cardiac contractile function. Circulation. 1997;95(4):778-781. 22. Zakirova A.N., Zarudiy F.S., Garifullin B.N. Beta-blockers and platelet aggregation. Carvedilol. Rational Pharmacotherapy in Cardiology. 2008;4:2:81-4. (In Russ.) [Закирова А.Н., Зарудий Ф.С., Гарифуллин Б.Н. Бета-адреноблокаторы и агрегация тромбоцитов. Карведилол. Рациональная Фармакотерапия в Кардиологии. 2008;4:2:81-4]. 23. Smirnov A.V., Dobronravov V.A., Kayukov I.G. The problem of chronic kidney disease in modern medicine. Arterial'naya Gipertenziya. 2006;12(3):185-93. (In Russ.) [Смирнов А.В., Добронравов В.А., Каюков И.Г. Проблема хронической болезни почек в современной медицине. Артериальная Гипертензия. 2006;12(3):185-93]. 24. Sigitova O.N., Bogdanov A.R., Arkhipov E.V., et al. Evaluation of the impact of hypertension, hyper-lipidemia on the formation of kidney disease in patients with coronary heart disease. Prakticheskaya Meditsina. 2012;64:157-60. (In Russ.) [Сигитова О.Н., Богданова А.Р., Архипов Е.В. И др. Оценка влияния артериальной гипертонии, гиперлипидемии на формирование нефропатии при ишемической болезни сердца. Практическая Медицина. 2012;64:157-60]. 25. Shalnova S.A., Martsevich S.Yu, Deev A.D. et al. The first results of a multicenter randomized clinical trial on the drug Akridilol in combination therapy in patients with hypertension and obesity or type 2 diabetes [ACCORD]. Kardiologiia. 2008;48(8):28-33. (In Russ.) [Шальнова С.А., Марцевич С.Ю., Деев А.Д., и др. Первые результаты многоцентрового рандомизированного клинического исследования по применению препарата Акридилол в комбинированной терапии у больных артериальной гипертонией и ожирением или сахарным диабетом 2 типа [АККОРД]. Кардиоло-гия. 2008;48(8):28-33]. 26. Fomin V.V., Svistunov A.A. Beta-blockers and hypertension: Do insurmountable limitations exist? Farmateka. 2013;9:8-12. (In Russ.) [Фомин В.В., Свистунов А.А. Бета-блокаторы и артериальная гипертензия: существуют ли непреодолимые ограничения? Фарматека. 2013;9:8-12]. 27. Chazova I.E., Boytsov S.A., Ostroumova O.D. Combination therapy of patients with arterial hypertension. Methodical letter to the Ministry of Health of the (In Russ.) Federation. Moscow: MZ RF; 2004. (In Russ.) [Чазова И.Е., Бойцов С.А., Остроумова О.Д. Комбинированная терапия больных артериальной гипертонией. Методическое письмо Министерства Здравоохранения Российской Федерации. Москва: МЗ РФ; 2004]. 28. Solal A.C., Jondeau G., Beauvais F., Berdeaux A. Beneficial effects of carvedilol on angiotensin-converting enzyme activity and renin plasma levels in patients with chronic heart failure. European Journal of Heart Failure. 2004;1;6(4):463-6. 29. Kolloch R., Legler U.F., Champion A. et al. Impact of resting heart rate on outcomes in hypertensive patients with coronary artery disease: findings from the INternational VErapamil-SR/trandolapril STudy [INVEST]. Eur Heart J. 2008;29:1327-34. 30. Poole-Wilson P.A., Swedberg K., Cleland J.G. For the COMET investigators. Comparison of carvedilol and metoprolol on clinical outcomes in patients with chronic heart failure in the Carvedilol Or Metoprolol European Trial [COMET]: randomised controlled trial. Lancet. 2003;362:7-13. 31. Smith G.L., Lichtman J.H., Bracken M.B. et al. Renal impairment and outcomes in heart failure: systematic review and metaanalysis. J Am Coll Cardiol. 2006;47:1987-96. 32. Arutyunov G.P. Recent widely discussed clinically relevant aspects of the impact of β-blockers. Sistemnye Gipertenzii. 2013;1:80-7. (In Russ.) [Арутюнов Г.П. Новые широко обсуждаемые клинически значимые аспекты влияния -блокаторов. Системные Гипертензии. 2013;1:80-7]. 33. Markova L.I., Radzevich A.I. Hemodynamic effects of carvedilol in patients with arterial hypertension. Rational Pharmacotherapy in Cardiology. 2006;2(3):12-8. (In Russ.) [Маркова Л.И., Радзевич А.И. Гемодинамические эффекты карведилола у больных артериальной гипертонией. Рациональная Фармакотерапия в Кардиологии. 2006;2(3):12-8. 34. Maksimov T.A., Panov A.V., Ivanov S.G., et al. Status of lipid peroxidation and endothelial dysfunction in patients with coronary heart disease complicated by chronic heart failure the influence of long-term treatment with carvedilol. Uchenye Zapiski Sankt-Peterburgskogo Meditsinskogo Universiteta. 2001;2:33-8. (In Russ.) [Максимова Т.А., Панов А.В., Иванов С.Г., и др. Состояние перекисного окисления липидов и эндотелиальная дисфункция у больных ИБС, осложнённой хронической сердечной недостаточностью влияние длительной терапии карведилолом. Ученые Записки Санкт-Петербургского Медицинского Университета. 2001;2:33-8]. 35. Chen J., Gu D., Chen C.S., Wu X. Association between the metabolic syndrome and chronic kidney disease in Chinese adults. NDT. 2007;22(4):1100-106. 36. Arutyunov G.P., Oganezova L.G. Hyperfiltration and metabolic syndrome. Sistemnye Gipertenzii. 2009;1:67-71. (In Russ.) [Арутюнов Г.П., Оганезова Л.Г. Гиперфильтрация и метаболический синдром. Системные Гипертензии. 2009;1:67-71]. 37. Tomaszwski M., Charchar F.J., Maric C. et al. Glomerular hyperfiltration: a new marker of metabolic risk. Kidney Int. 2007;71(8):816-21. 38. Krasil'nikova E.I., Blagosklonnay Ya.V., Bystrov A.A. et al. Adiposopathy - a key element of the state of development of insulin resistance. Arterial'naya Gipertenziya. 2012;18(2):164-76. (In Russ.) [Красильникова Е.И., Благосклонная Я.В., Быстрова А.А. и др. Адипозопатия - ключевое звено развития состояния инсулинорезистентности. Артериальная Гипертензия. 2012;18(2):164-76]. 39. Pham H., Utzschneider K.M., De Boer I.H. Measurement of insulin resistance in chronic kidney disease. Current Opinion in Nephrology and Hypertension. 2011;20(6):640-60. 40. Spoto B., Pisano A., Zoccali C. Insulin resistance in chronic kidney disease: a systematic review. Am J Physiol Renal Physiol. 2016;1;311(6):F1087-F1108.